Corfu,  known also as Kerkyra, is the northernmost of the Ionian Islands in Greece. Located off of the far northwest coast of the country, Corfu lies in the Adriatic sea, east of Italy and southwest of Albania. Historically Corfu has been controlled by many foreign powers, notably the Venetians, French, and British. The South of the island is less wide (only a few miles across from west to east) and tends to have sandier beaches. It also has a quieter and more genuine atmosphere especially south Messonghi on the east shore or Aloniki on the west shore. Gouvia is 7km north of Corfu Town. It is a typical touristic spot with a narrow pebble beach and does not deserve a long stay. The satisfactory infrastructure and the multiple possibilities for various activities are ideal for group holidays on Corfu and the nearby islands. Motivation trips, congress tourism, school trips, Ferrari or antique cars clubs and Harley Davidson groups meet here every year. Corfu's nature, sea and history have made sure so that you today, no matter when you come, or how long you will stay, or your style, you will certainly find original and interesting situations to exercise and to have fun. In a place with a tradition in tourism of at least 130 years, with Greek education and the influence of “nobility” from England, France and, surely, Venice, in a place which is used to welcoming the international jet-set for several decades now, the possibilities for sports and amusement are certainly impressive. Corfu "Ioannis Kapodistrias" airport (CFU) (IATA) is served by several airlines. Year-round both Aegean and Olympic airlines have flights to Athens. Also Sky Express flies from and to Corfu, from Preveza and several other islands such as Kefalonia, Zakinthos, Kithyra and Heraklion. In the high season (roughly easter through October), other airlines including German Wings, Easyjet, Air Berlin, TuiFly, LTU, Ryanair, Transavia and Wizzair serve the island. Attention: Whenever you have a printing facility around you, make sure you check your return flight on line and have your boarding passes printed. This will give you peace of mind as leaving it for the last minute could be stressful: There aren't many webcafés or hotels with printers around. This is particularly recommended for Ryanair passengers as they charge you hefty just to print a boarding pass! The authorities regulate tariffs for all licensed taxis. If the taxi is licensed, it displays a rate card in the window or on the dash. In case you don´t see any rate card, ask the taxi driver for the rate. The approx. cost of a ride from the airport to the city is 10 Euro. Taxis are obliged by law to issue receipts, however many tend to "forget" it, or even not starting the taximeter. Shared Shuttle Service can be reserved online. The approx. cost of a ride from Corfu Airport to Corfu is 16 GBP/person (Cabfind Holiday Transfers or Transfers Corfu). If you prefer not to share a car with other people you can book a private transfer from the airport in advance. Most companies, which offer this service, require the booking has been made at least 24 hours in advance. Direct Ferry links exist to/from Venice, Ancona, Bari, Brindisi (Italy), Himara and Saranda (Albania) and Igoumenitsa, Patra (Greece) . As of March 2008, a bunk in a four- person cabin from Venice to Corfu was €107. Cruise ships dock at Corfu's New Port, which has a terminal with a welcome center (pick up an excellent town map). Outside the terminal to your left is a long parking lot with rental cars and taxis, and beyond that a public bus stop. From the New Port, you can see the Old Fortress, about 3 km to the east. To get to the Old Fortress, you can take a shuttle, if the cruise ship provides one ( €7), or a 10-minute taxi ride for about €17, or walk along the seafront for about 30 minutes. There is also a public bus (Port / Kefalomandouko No.2b Blue Bus Stop) at the end of the large port parking lot that will take you to Old Port Square by the New Fortress for €1.70. More information can be found in a port guide. If you come in your own yacht the Marina, Gouvia offers you a comfortable stay, very close to Corfu town, while in the town you can moor off at the NAOK harbour, as well as at the Old Port. You can also moor off at Benitses Marina, not far from Corfu town. There are two types of buses in Corfu - Blue buses serve Corfu town and the environs, Green buses serve the rest of the island. The Blue bus terminal in Corfu Town is in San Rocco Square. The bus information kiosk displays timetables and provides maps showing exactly where the buses terminate (some terminate a few blocks south of the square). Bus stops have electronic displays, and self-service ticket machines. Tickets are single-journey only and must be validated on the bus. They can be bought from the machines, or from the driver (for €0.50 more) (see full timetable here. Useful lines include the number 7 which goes to and from Dasia every 20 minutes (30 minutes on Sundays), the 10 which goes to and from Achilion every two hours, the 6 to and from Benitses (not quite hourly) and the 11 to and from Pelekas every 2-3 hours. 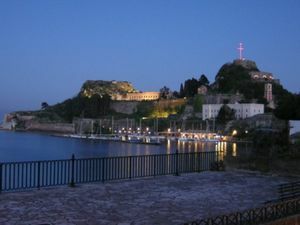 The Green Bus Station is near the New Port, from where buses depart for all villages of Corfu Island. Regular departures to Paleokastritsa, Sidari, Kavos, Roda, Acharavi, Kassiopi A full timetable can be found here. You can rent a car at the airport or through one of many local companies. International franchises such as Hertz have counters at the airport and the main ferry terminals). For your peace of mind, you may opt for one of these as some travellers have had bad experiences with lesser known companies and their so-called 'full' insurance coverages. In general, it is cheaper to pre-book a car rental via the Internet before arriving. Many of the roads are very narrow so it can be better to choose a small car. 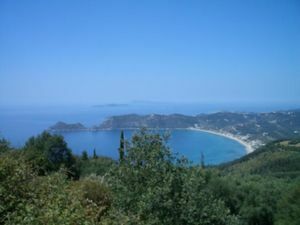 While there is a good road running North-South along the East coast from Sidari to Lefkimmi and from Corfu town across the island to Paleokastritsa, many roads have poor surfacing. Often the insurance provided for hire cars does not cover damage to the underside of the car so watch out for large holes in the road. Car rental companies often provide a free map but you may find it worth buying one in advance as the maps are not especially good, especially for the North-West interior. Unfortunately online mapping tools like Google Maps are not accurate enough to offset the low accuracy of some addresses so it is highly recommended you come with your own GPS device. Also, be careful to rent Quads in Ypsos. Some local companies have been reported to rent out unsafe and faulty Quads. A typical Corfiot village on the slope of a green hill. You should go for a walk to Bella Vista to admire the view over the bay of Paleokastritsa and relax in one of the picturesque coffee shops. If you like trekking there is a path leading down to Paleokastritsa. The surnames of the inhabitants of the region refer to the soldiers who supported Angelokastro in the late Byzantine period, as well as to refugees from Mani. Among the houses of the 18th and 19th centuries you will find churches and traditional coffee shops. At the central church you will see donations of the first emigrants to America of the late 19th and early 20th centuries. Located in the north east" phone, Old Perithia is Corfu's Oldest Village. A Heritage Protected Site in a Designated Area of Natural Beauty. The village is locates at 408m above sea level and nestles below Mount Pantokrator, it was once a hideaway from pirate attacks with a look out tower from which you could see, but not be seen from the sea. There are 8 churches and 130 houses, some in various states of disrepair, but the village offers an excellent example of the Venetian influence on the island and it is said that Old Perithia was once the wealthiest of the villages. In its heyday, It had an abundance of oak trees, vines and thousands of sheep roaming the mountainside. As olives would not grow so well at this height, the oaks and vines remained, along with other fruits, cherry, fig, walnut and almond to name but a few. There is on four star accommodation in the village, The Merchant's House B&B whose owners are credited with it recent restorations, and four tavernas - that are open all summer, and at weekends throughout the winter. The village is located 7km up from the coast road, opposite Ice Dreams, and clearly signposted. Most of the 8 churches are family owned but Agios Iakovos Persis, the church at the (now) entrance to the village is being lovingly restored and contains some remarkable frescoes inside. It is due to open to the public from late 2014. Parking is limited and there is a no through sign as the village is only accessible to the few residents who currently live there. 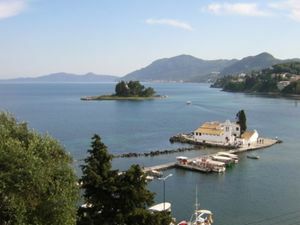 A former fishing village and one of the most traditional Corfiot villages with unique natural beauty and a very popular and famous tourist destination, used to be the first tourist resort of Corfu. is situated on the Eastern coast of Corfu, only 12 kilometers from Corfu town, and 9 kilometers from the international airport Ioannis Kapodistrias. The coastal road of Benitses is full of hotels, restaurants, cafes and other shops that offer everything the most demanding visitor can ask. Benitses is surrounded by the mountains in one side and the aquamarine waters of the Ionian Sea in the other, this unique combination of nature with the hospitality of the residents, which are very familiar with different cultures, are what make visitors to love the place. 2 miles to the north there is the famous Achilleion palace. Aqualand, Agios Ioannis. It's quite a small water park with only a few main "rides". It is best to travel to and from the park under your own steam as a whole day there with an organised trip might be too long. Kassiopi. One of the more relaxed and atmospheric resorts with a pretty bay and beach that is mostly stony. The waters are crystal clear and calm. Somewhat spoilt by the prevalence of tacky tourist bars/cafes catering to the many English tourists that crowd the town. 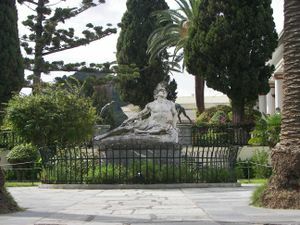 Glifada. A long wide sandy beach with fairly rough waters. The resort is somewhat isolated. Pelekas beach. Even more isolated than Glifada. Also a nice sandy beach. Lefkimmi beach. A wide long sandy beach that is quiet due to being in the less busy South. There's a practical taverna with a children's playground. The waters are extremely calm and very shallow, even out for quite some distance. Chalikounas beach. A very long, virgin stretch of land, caught between Chalikiopoulos' Lake and the Adriatic sea. The natural landscape here is unique, it is a great place to get away from the world and just enjoy both sea and sun away from the mass tourism crowds. You can rent a pair of long chairs for 6 euros a day. You can also take kite surfing lessons next to the bar. Prasoudi beach. High cliffs hang over your head, clean waters and a mix of sand and pebbles on this remote beach. Messonghi beach Gentle current, ideal for children, clean water with sand, pebbles and plenty of little fish. Benitses A former fishing village and one of the most traditional Corfiot villages with unique natural beauty and a very popular and famous tourist destination, for many decades used to be the first tourist resort of Corfu, it is situated on the Eastern coast of Corfu, only 12 kilometers from Corfu town, and 9 kilometers from the international airport Ioannis Kapodistrias. Premier Internet Café, main road, Moraitika (GPS 39.485777,19.924994). A nice bar with an excellent service. There is an internet café section with a dozen computers and a couple of printers available. Corfu is an ideal location for a keen walker. The North is fairly rugged with Mt. Pantokrator, the highest mountain. Beneath the mountain is Corfu's oldest village, Ano (Upper) Perithia. At the other extreme is Korission Lake (in the South), an inland lake, separated by a thin sand bar from the sea. 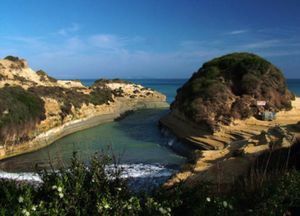 The Corfu Trail is a 222km long distance footpath covering the full length of the islands. The route is well signed and a book accompanies the trail , there is also an introduction, history and walking guide for Old Perithia, Corfu's oldest village which you pass through on the Corfu Trail. There is a lot of yachting going on in Corfu and the Ionian, which, in general, is an ideal place for sailing and yachting with steady fair winds all summer long. The main shopping street in Corfu Old Town, Theotoki Nikiforou Street, connects the Esplanade (by the Old Fortress) with Spilia (by the Old Port and New Fortress). Gingerbeer. Corfu was a British protectorate and gingerbeer is one of the British style drinks that the locals adopted with enthusiasm. The Greek version is simply excellent. Ask for it at Liston or better restaurants and coffee houses. Locally it is called "Tsitsibeera". Corfu has countless options for accommodation - from 5 star hotels in Corfu town to spare rooms you will only find by asking around as well as many private villa and vacation rentals that are typically booked in advance or online. With so many people staying in Croatia and other hot spots, accommodation in Corfu is plentiful, but note that most of the accommodation is in the coastal areas - budget hotels are not so easy to find in Corfu Town. Corfu makes a good start for a tour of the Western Greek Islands. It's also a good jumping-off place to get to Italy or Albania. Day trips to Paxi and Sarande are popular, usually combined with an excursion to the UNESCO World Heritage site of Butrint which is to be highly recommended! A tour of the Albanian Riviera is a must! This page was last edited on 5 April 2019, at 09:41.